Are you just getting into camping and not sure about over the fire cooking? It really is not as hard as you think. When you know a few camp cooking hacks on over the fire cooking you will feel just like you are home in the kitchen. Below I am going to share some tips on over the fire cooking. 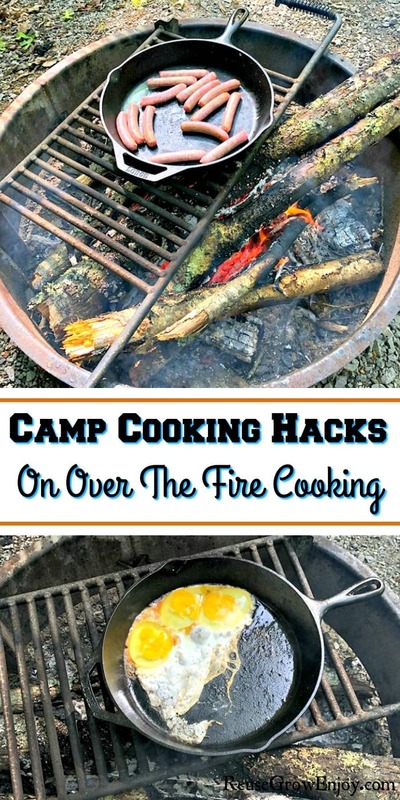 After you have learned some of these camp cooking hacks, you may also want to check out this post on Campfire Recipes. 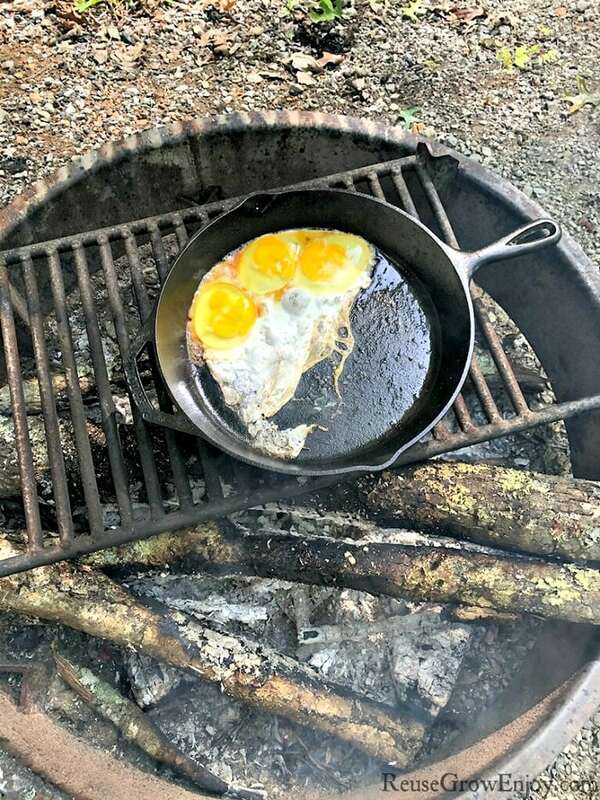 Before you head off to camp there are a few must-have cooking gear items that you should make sure you have. Most campsites do come with a fire ring but may not come with a cooking grate. You will also need to make sure you bring your own cookware too. Here is the top must have cooking items that you should always have with you. These are a few not must have but handy items to have that you may want to think about getting. One of the most important things about over the fire cooking is the fire itself. While it is pretty easy it is not simply just light a few sticks on fire and toss a pan over it. You need a good base before you start cooking. If you are not sure how to start a campfire, you can check out my post on How To Build a Campfire. After you have it started, you need to let it burn some before cooking so that there is a nice base of coals to maintain the heat. One thing to note about over fire cooking is not to add all the wood at one time after you have it going. You need a smaller steady burn, not just a huge fire that will burn out fast. So get a nice smaller sized fire going well, then keep adding a few pieces on at a time to maintain it. One mistake lots have made is to place their pan right over the flame of the fire. While you can do this with select foods, most items cook best when placed not directly over the flame but more to the side of it. By placing it to the side, it allows it to cook more evenly without scorching it. You can also control the temperature by moving it away or closer to the fire. So if you need to cook something say over low heat, just move it a little more away from the direct flame. The only time that you may want to place right over the flame is if you need to sear meat like when cooking chops or steaks. There are a few different ways to cook over fire. I am going to go over a few of the different ways that work best for fire cooking. Let’s take a look at what they are, how to do it and what types of foods each method works best for. Pan cooking is just like it sounds. It works much like you would cook using a frying pan at home. You just put it on top of the fire grate to the side of the flame. This method works great for eggs, meat, grilled sandwiches, saute veggies and more. Dutch oven really is a multi-use cooking tool. It can double as a pan and do everything the pan can do and so much more. All it is as a deep pot with a lid. In addition to all the things a pan can do, you can also use the dutch oven for soups, stew, chili, casseroles and even bake! You can either use it on a fire grate if using as a pan or a pot. If you have a dutch oven with a hanging handle you can also use it on a tripod. To use it for baking you need to have it sitting on a few hot coals at the edge of the fire with a few hot coals also placed on top of the closed lid. When you thinking of camp cooking if you are like me your mind defaults to stick roasting. It is something most of us did as a kid in the backyard. If you have never done it before, stick roasting is where you have long handled stick or prong where you place food on the end and hold it over the fire until it is done. This works great for making things like marshmallows and hot dogs. However, you can use it for other things too! When fire cooking with a roasting stick you can also use it for things like bacon (make it like a crinkled fan on the end of the sick so that the stick runs through it many times), sausage links, kabobs and more. You can even make cinnamon rolls or biscuits when stick roasting! Simply wrap them around the end or stick the prongs through it and hold over the fire until done. Try not to hold it right over a flame but more to the side of the flame so that it heats but not burns. Pie iron cooking is a mix of pan and stick roasting. It is a long handle pole with a cast iron pan at the end. 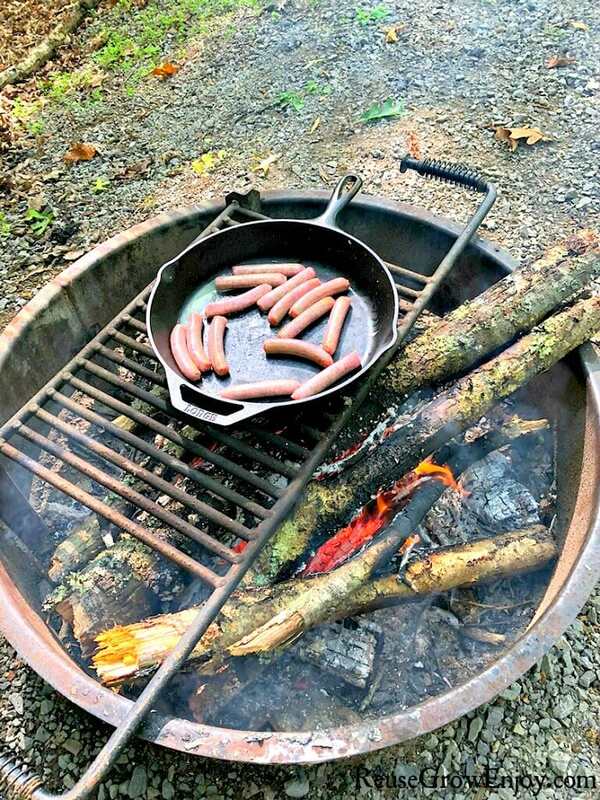 You put your food in the pan and hold it over the fire. This works great for making/baking small hand pies, toasted sandwiches, hot pockets, french toast, grilled burritos and lots more. Foil pack fire cooking I think has to be one of the easiest ways to cook. It is also great for when you just want to throw on dinner and step away for a little while without having to watch it closely. You can do this method of cooking by placing the food inside a piece of thick foil. I say thick foil because some of the super cheap kinds can have holes punched in to easy and you don’t want your food to spill out into the fire. After you have the food in it, fold it closed. Make sure it is nice and secure so nothing spills out but do leave a small vent. You can do that by leaving just a small area open on one end or by cutting a small slit in one end. Then place it on the grate to the side of the fire and allow to cook. You will want to flip them over about halfway through cooking. That should be about 15 min depending on what you are cooking. You can also toss them right at the edge of the fire pit where the coals are if you do not have a grate to place them on. If you do it this way, you may need to turn them a little more to keep from burning. If you found this helpful, here are some other camping posts you may want to check out. Excellent KISS. Add a link to that grate. If you are car camping, and can lift 50 pounds, the brake drum off a semi found at a local junk yard or recycling center makes an excellent literally bulletproof portable firering. That is a great tip! Thanks, Robert!